The Steel Platform Trucks are an affordable solution when you need to move large and heavy loads up to 4,000 lbs. 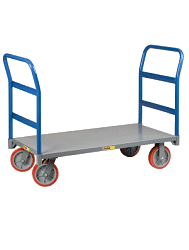 These platform trucks are made from heavy duty 12 gauge steel reinforced welded construction. Removable two cross-brace handle can be inserted in either end. • 10" Full Pneumatic Casters. • 32" high handles from platform top. • Heavy duty 12 gauge steel reinforced welded construction. • Constructed for both standard corner or diamond caster mounting pattern. • Removable two cross-brace handle can be inserted in either end. • Eight platform sizes available. • Each caster set contains 2 swivel and 2 rigid casters. • Easily move load up to 4,000 lbs. • All listed capacities are based on evenly distributed loads. This cart is great. We use these carts daily and would be really handicapped without them. They are sturdy and compact, very well made. Very well made material handling cart. Very happy with the purchase.